The blockchain technology is increasingly perceived as promising and advanced and the Maker project made a great contribution to it, promoting the concept of decentralized exchanges and stablecoins. Maker’s ecosystem is built on smart contracts (Collateralized Debt Positions) and largely relies on the MKR token. Let’s examine the token value and try to forecast MKR price predictions for 2019, 2020 and further. Maker (MKR) token launched in 2017 by the Maker DAO project based on the ERC-20 Ethereum smart-contract standard. As a decentralized autonomous organization on the Ethereum blockchain, the Maker project aims to create stable digital assets (such as DAI) and reduce their volatility relative to the U.S. dollar. So what is the place of the MKR token in the project’s system? MKR is a utility token which is necessary to pay Stability Fee when generating DAI. It is worth noting that MKR tokens are burned and deducted from the supply after the payment is done. Being a quite volatile cryptocurrency, MKR plays a significant role in maintaining the stability of the DAI stablecoin. I follow from the foregoing that the MKR price is in direct proportion to the demand for DAI. The lowest DAI price since January 2018. Most of the time it’s very close to $1 USD. MKR acts as a governance token: MKR holders have the opportunity to influence the direction of the Maker project and participate in risk management. MKR tokens are automatically created and sold on the market when the system is lacking value and threatening to become unstable. Debts collateral is against ETH. The coexistent of Ethereum, Dai and Maker seem to be a very complex system, especially for beginners. Cyrus Younessi, Risk Management Lead at MakerDAO, tried to give a simplified explanation and described ETH as digital gold, DAI as payment and MKR as insurance. 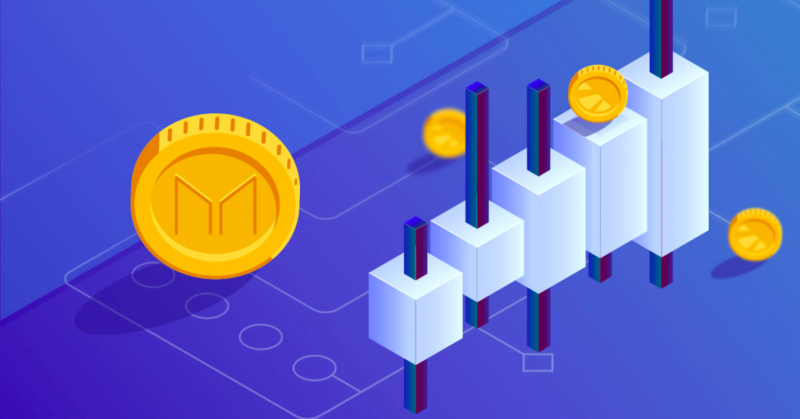 One of the MKR’s features is that the developers built the system from scratch, and the right to choose an initial MKR price was given to the market. At the end of January 2017, the MKR price was 22.10 USD. The MKR price chart is showing an uptrend throughout 2017, rather stable situation in autumn and a strong leap at the end of the year when the Maker team launched a system of smart contracts. The highest peak of the MKR token price was observed on January 18, 2018 – it equals $1690.19 USD. Such a sharp price rise was replaced by a declining trend until April. The next high point was 1155.58 USD on May 3, which was also followed by a price reduction to about the same rate as in April. By the end of 2018, such sharp price peaks were not observed. The situation seems to be quite stable, especially considering the cryptocurrency crash. And now we are surely wondering what the Maker price will be in the future. At the time of writing this article, MKR is ranked 18th by market capitalization with $512,842,273 USD of market cap (according to Coin360). Сompared to the beginning of the year, the Maker price has markedly increased since February 2019. Moreover, MKR was ahead of many cryptocurrencies in the matter of price growth during that period. The MKR current price equals approximately 700 USD, and the price remained roughly at the same level throughout March. The lowest price at 620 USD was observed March 4, 2019 alongside the BTC price fall. Recent Bitcoin & overall crypto market bull-run on the 2th of April. Many experts think that MKR is a good option for investment, taking into account stability endeavor in terms of crypto. From this position, MKR will have a bright future, as the token stands on a solid blockchain ground. With a positive look at things, the MKR price has a chance to rise above 1000 USD by the end of 2019, and a more significant hike can be expected by 2020. For this reason, the MKR is considered a reliable long-term investment. There are also more down-to-earth experts who assume that the price of MKR will be at about the same level of 650-700 USD throughout 2019. Undoubtedly, much depends on the management of the system, where the involvement of MKR holders plays a vital role. If the system is insolvent, the recapitalization option of MKR is activated, and it can possibly (but not necessarily) lower the MKR price. If the management is balanced, MKR tokens are automatically burned, and the value of the remaining coins is higher. As the level of crypto literacy increases, our society becomes aware of the risks and more passionate about blockchain technologies and stablecoins. Rune Christensen, the CEO and founder of MakerDAO, claims that DAI gathers a large number of companies around. 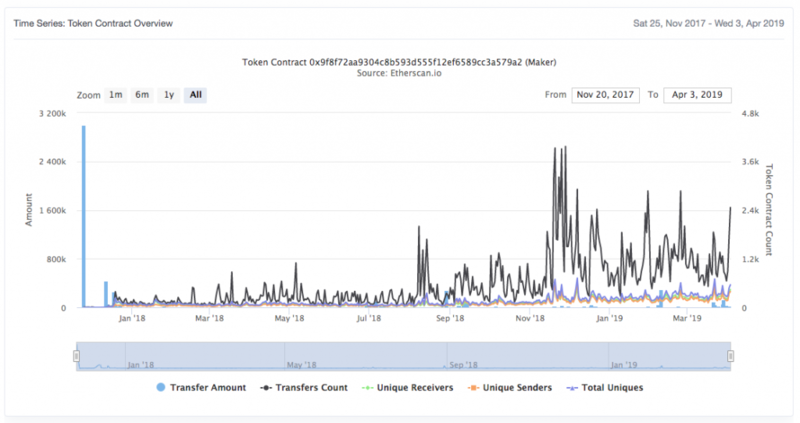 This gives a reason to believe that the usage of DAI will grow too, which will positively affect the MKR Token price. Previous Post:Bitcoin Price Bull-run: Crypto Market “Weighs” More than $160 billion!